Controlled Labs White Rapids Review – Should you buy it? Looking for the right pre-workout supplement? Controlled Labs might just have the right blend for you. Controlled Labs developed White Rapids as its answer for the increasing demand for pre-workout supplements. Over the years, more and more people turned to pre-workout supplements for its stimulant benefits that increase focus, power, and endurance. White Rapids has a curious blend of nitric oxide boosters, stimulants, and nootropics. While the blend is fairly new in the world of pre-workout supplements, it’s a breath of fresh air to those who are fed up with stimulant-laden pre-workout supplements. 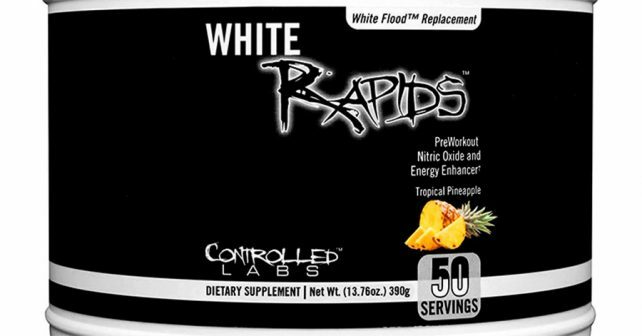 White Rapids is Controlled Labs’ second pre-workout supplement. Its first supplement, White Flood has been phased out by the manufacturer, and introduced White Rapids as its new, improved version. Compared to White Flood, White Rapids is almost identical, only differing in some aspects such as the absence of L-Carnitine, the lowered Caffeine, and the abundance of pump-inducing ingredients on the new version. Controlled Labs is known for selling products in stacks. It wouldn’t be a surprise if many users picked up White Rapids because of the discounts offered by Controlled Labs. Pre-workout supplements are used by people who want to get more results from their workouts. The first thing you would notice on White Rapids’ supplement profile is the abundance of nitric oxide boosters – the kind that you wouldn’t normally see on pre-workout supplements. L-Citrulline Malate, Hydromax, and Agmatine Sulfate are all nitric oxide boosters that help improve the pump during workouts. The pump is produced by the increased blood flow to the muscles, as well as the increased fluids pumped to the muscles. It’s no wonder that the first thing users notice about White Rapids is the increased pump during workouts. Increased blood flow isn’t just for pump; it can also increase strength, endurance, and recovery for users. It’s also notable that White Rapids has toned down its caffeine content. With only 75mg of caffeine, it’s just like taking a big cup of coffee before your workout. With caffeine as mild as it is on a serving of White Rapids, you are less likely to experience a caffeine crash. Many users also notice the effects of White Rapids’ primary nootropic, Huperzia Serrata, which increases the focus and energy of the user. Users are generally pleased with the product. However, White Rapids isn’t as affordable as the other pre-workout supplements are. At roughly $1 per serving, it’s quite expensive for a nitric oxide booster. The best part of White Rapids is its focus, which can be attributed to its Huperzia Serrata ingredient. Other than its nootropic properties, there’s nothing else that stands out. It would be smart just to purchase a nootropic and just take the best muscle building supplements like NitroGenix 365 to get the results you want.